To view 9 more pictures, interactive maps and the full, detailed description of the River's Bend at Uncle's Neck community, please Login. Building a home on the land in River’s Bend at Uncle’s Neck with a custom home builder can be exciting. This pastoral paradise is the perfect prescription for permanent peace. Home sites are set on the banks of the Chickahominy River and Uncle’s Neck Creek and are large enough to give families room to grow. Located near Williamsburg, VA, this development is removed enough from the city so residents can see the stars. Sentara Williamsburg Regional Medical Center and military bases such as Camp Peary, Joint Base Langley-Eustis and Naval Weapons Station Yorktown are not far from this retreat in Hampton Roads. When building a home, owners must be ready to devote time and energy to the process. One way to help alleviate some of this pressure is to hire a custom home builder. An experienced builder walks property owners through the process and turns out an amazing finished product. The land in River’s Bend at Uncle’s Neck is ready for whatever plans buyers bring to the table. Lots range in size from three to eight acres and most have waterway views. A custom home builder can integrate your new home into the lay of the land so well; it will look like it was meant to be. Williamsburg lies within America’s Historic Triangle. Residents of River’s Bend at Uncle’s Neck can take lessons from the past, which is all around them. Building a home in this region allows owners to see a new side of Virginia. Shop, dine and explore in Colonial Williamsburg. Enjoy museums and landmarks to trace important events. Golfers will go gaga over the number of courses around here. Colonial Golf Course, Golden Horseshoe Golf Club, Williamsburg National Golf Club, Kingsmill Resort and Stonehouse Golf Club are some of the choices for golfing aficionados. When homebuyers are ready to get out of the real estate rat race and begin building a home, they can look at land in this community. With the help of an experienced custom home builder, homes can take shape and become the center of family life. 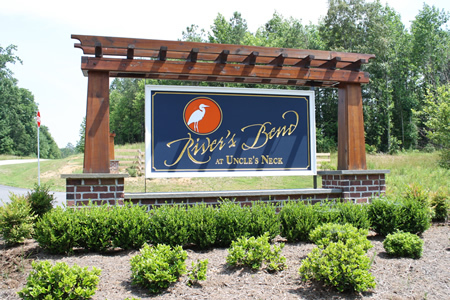 Take a peek at homes in River’s Bend at Uncle’s Neck and see the only thing missing is you. Send me more information about the River's Bend at Uncle's Neck new home community. Our agents gladly offer FREE property tours of River's Bend at Uncle's Neck, Williamsburg and homebuyer consultations to all serious buyers.